The Counterfeiters won the Academy for Best Foreign Film in 2008, and deservedly so. 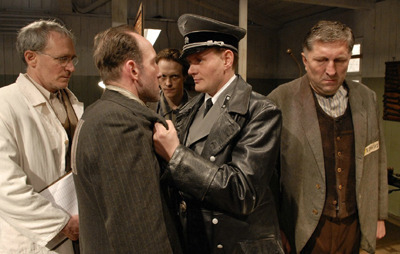 Directed by Stefan Ruzowitzky, it recounts the true story of Operation Bernhard - the Nazi's plan to destabilize the British and American governments by flooding their economies with forged pounds and dollars designed and printed by Jews interned at Sachsenhausen. Central to the story is Salomon "Sally" Sorowitsch (a superb Karl Markovics), a master counterfeiter who is captured in Berlin at the start of the war by Friedrich Herzog (Devid Striesow), who later becomes his jailer at Sachsenhauser. The Counterfeits is a fine film full of fine acting - kudos to both August Diehl (as Adolf Burger) and the young Sebastian Urzendowsky (as Kolya) - that drags us into the dirty moral quicksand associated with Nazi complicity and lets us struggle with the question: what would you have done?